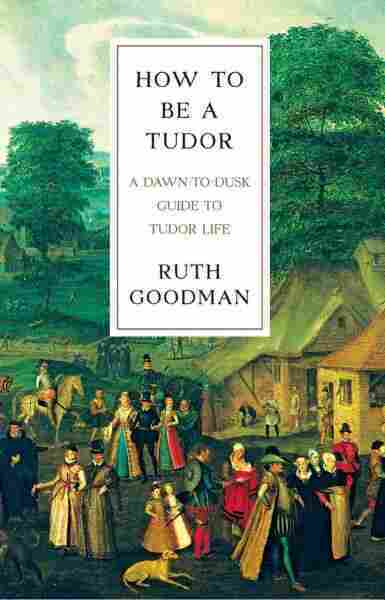 'How To Be A Tudor': Not As Stinky As You Think Ruth Goodman — adviser to BBC productions like Wolf Hall — digs deep into the everyday life of Tudor England in her new book. Surprisingly, Elizabethan hygiene isn't as bad as you might think. Sometimes you want your history close to home. It's a good thing, then, that Ruth Goodman seriously commits to her research. In How to Be a Tudor, billed as "a dawn-to-dusk guide to Tudor life," she recounts her experiences with lower- and middle-class daily habits, including Elizabethan hygiene regimens (not bad), rush-mat floors (quite nice), roasting meat on a spit (spectacular) and attempting to plow fields for planting (sad trombone). This isn't the first time Goodman has immersed herself in a bygone era; she previously tackled the 19th century in How to Be a Victorian. For those hoping for an identical experience, How to Be a Tudor doesn't quite reach the same breadth of detail that went into How to Be a Victorian. Then again, that's no surprise, given that the literacy rates of Tudor England hit a maximum of about 30 percent, and documentation is trickier to come by — and that's before you start looking for genetically accurate manchet wheat to make your period-correct bread. In fact, Goodman's Tudor research sounds like detective work as much as anything, from sorting out the proper bookkeeping allocations for shirts in tradesmen's wills to figuring out the invisible steps left out of advice manuals in their instructions for making cheese. But what you lose in extant documentation, you gain in the visceral detail that comes with hands-on experience. Her description of an Elizabethan suit of clothes is positively breathless, and tracing the amount of work that went into making even a modest Tudor meal is enough to make you want a nap by proxy. The rush floors might be obsolete, but the crucial importance of ephemeral etiquette and the social panic about those who aimed above their station haven't changed at all. Scholars even released pamphlets scolding the youth on the bawdy language of their popular songs; if that doesn't make the past come alive, nothing will. This sense of the past mapped over the present isn't touched on overmuch by Goodman herself; she's here to demystify the past, with only occasional threads drawn directly to the modern day. (There aren't even many illustrations; in this book, the ways in which people spoke about dancing and the flow of energy through an evening is more important than an actual map of steps.) But at some point, reading about the everyday minutiae of the past ceases becoming a list of the ways Then is different from Now, and just becomes a list of malleable human follies that are separated more by wishful thinking than by anything else. The rush floors might be obsolete, but the crucial importance of ephemeral etiquette and the social panic about those who aimed above their station haven't changed at all. Scholars even released pamphlets scolding the youth on the bawdy language of their popular songs; if that doesn't make the past come alive, nothing will. And at heart, How to Be a Tudor wants nothing more than that. Engagingly written and awash in the practicalities of life in the age, it presents a vivid, fascinating era of British history and reminds us that we're never as far from the past as we like to think.